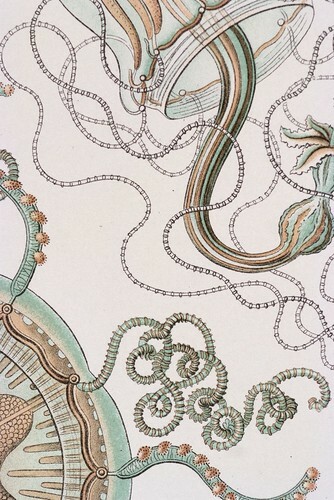 Trachomedusae (detail), Ernst Haeckel, Kunstformen der Natur. Chromolithograph 32 x 40 cm, Verlag des Bibliographischen Instituts, Leipzig 1899-1904. Photograph by D Dunlop. Please note that ordering events in these ways does not depend on any preconceived notions of space or time, events are ordered by their sensory qualities only. But later we will use $\Psi$ as a mathematical way of representing chronologically ordered experiences. Then as we go from discussing individual-events to chains-of-events our reports get animated. Chains may be called histories or processes. We can even think of them as little movies.